Inspired by years of experience in security laminates for documents, we master the bonding process of holographic layers onto a personalized passport datapage. We offer a stand-alone passport lamination system that perfectly suits the new generation of ultra-thin laminates. 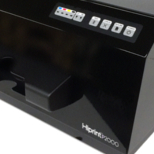 In addition, we propose a wide range of highly secure inkjet printers for machine readable passport booklets. 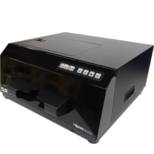 We also engineered from stand-alone single stations to a modular all-in-one passport personalization system that can integrate all the different functional modules you may need, in-put and out-put stacking printing, lamination, quality control, RFID reading and encoding, for middle-sized centralized and also decentralized operations. 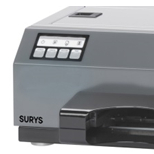 Among the personalization systems developed by SURYS, you can find the Hilam™ P2000, Hiprint™ P3000 and the SURYSCube.